These Chips enjoyed a nice crack and crumble. They did not mush up, neither did they maintain their integrity too long, but instead there was a staged steady mulch to swallow. These were very nice looking Potato Chips.They were bendy and curly. There was skin on edges. There was a real oil boiled gnarled look about them. Some brown parts and lots of green flecked seasoning. A Nose Plunge Test revealed a nose stinging Dill pickle smell, but the flavor delivered a less strident taste. 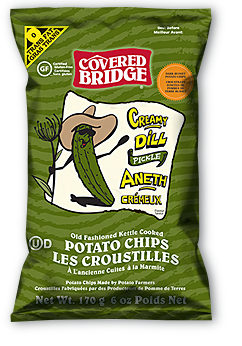 Dill Pickle, or Gherkin, flavored Chips can often leave a salty aftertaste, which is perhaps not surprising because it really is a very strong flavoring variety. However, these Chips featured a slightly more muted taste that hit the spot perfectly. They balanced the Potato well with Dill and nothing was overwhelming or commanding. It was simply a perfectly balanced and pleasant, rather than overly strong, taste and hit the puck into the back of the net brilliantly.